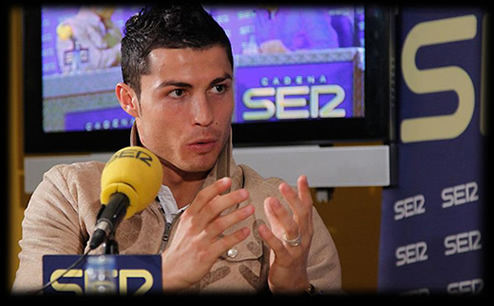 You can now watch the full interview that Cristiano Ronaldo granted to Cadena Ser (El Larguero show) in video. The entire interview is made in Spanish, but you can read the highlights translated to english below the videos. A: I was also that age at one point and I had the same dreams. Why not? They have their whole lives in front of them, and they need to believe that one day they will become footballers. Looking at them is like going back in time, because it reminds me of my childhood, my dreams. Q: What were your dreams? A: I was a normal kid who liked to play with the older ones. I only stopped playing football when my mamá called for me to go home. Those were the happiest moments of my life, because you do things without thinking, you say what you think, you have innocence… and thanks to this childhood which I enjoyed a lot, I was able to achieve my dream of becoming a footballer. And I’m happy to be one. Q: When you played with the older kids, did they give you more kicks than you’re receiving now? A: The same, because I was small, but I already did many things with the ball, the same I do now. I would get up and continue, because they were older and if I talked back to them, they would hit me. Q: Were you very small? A: Very small and very thin. I grew a lot when I was 13 or 14. That’s the way my genes were. Q: What is the secret to success? A: I have a very clear and defined opinion on this. You always have to believe and feel that you can become a footballer, that if you work hard and have ambition, you can get to where you want to be. We all have an opportunity in life and you have to believe in it. I started at the age of 12 with Sporting de Lisboa and everything went well for me after that, although I had to leave my family in Madeira and I cried every day. There were some very complicated moments, but I overcame them because I always believed I could become someone in this life, with the help of my family and the directors in the club. Q: Did leaving your family at that age leave a mark on you? A: It was a very painful moment. I left the persons that loved me the most for a different place where no one knew me. But if I hadn’t gone through this, I wouldn’t be the person that I am today. That’s why I’m also very grateful to my family for not holding me back. Q: You just came back from Geneva, where Messi won. Did you talk to him? A: I don’t see it as a personal battle. We talked during one moment in the game and we spoke of normal things, nothing special, just like with Di María. Q: Do you think you receive more blows than Messi? A: Well, if you see my legs, you’ll know the answer. Q: All right, let’s see them. A: The right or the left? Q: The left and then the right. (Cristiano showed De La Morena but unfortunately they were behind the desk and no one else could see). It’s true. A: But it’s normal, I’m used to it. I’m not going to enter into the debate about who receives more blows. Q: You have the image of being very “chulo” (cocky). Do you understand what “chulo” means? A: Now I do. It has a different meaning in Portuguese. Do you know what it means? No? I’ll explain it to you later. But in Spanish it’s different. Each person has their opinion. I don’t care what others think of me. I don’t open myself up to everyone because I don’t want everyone to know the real me. I’m used to it. Some things that I hear bother me, but this forms part of my life and my way of being. Q: And how do you put up with all the chants of “ese portugués, que hijo de puto es…”? A: I only listen when they say, “ese portugués, que bueno es.” I don’t hear the rest, I go like this (Cris puts his fingers in his ears). Q: Does it motivate you? Q: Would you like for them to have another opinion of you? A: No, I don’t care. Those who shout things at me and insult me when I’m on the field are the first ones to later say, “hey Cristiano, a photo!” But I don’t think it’s everyone, there’s a small percentage that infects the rest. These people are also stupid because they just follow along. Q: Why do you think they shout that at you? A: The truth is, the truth is, the truth is… I’ve tried to analyze it many times, but I still don’t understand why. It could be because I’m a good player, because I’m handsome, because I’m ugly, for the way I am, for envy… I don’t know, I don’t know how to answer this. Q: Do you think you’re a good person? A: A very good person. (Yes?) Yes. I’m not hypocritical or fake. I say things to your face. If you don’t like it, well life is like that. I try to be courteous. And if you’re good to me, I’ll be good to you. Q: Has your life changed now that you’re a father? Do you see life in a different way? A: It’s changed a lot. It was one of the best things that happened to me. In the beginning, it was a bit strange, but then you begin to see things differently and now I’m very happy. It was a dream I had, and it came true. Q: Does he resemble you? Q: Will your son’s future be easy or difficult? A: He’s going to be under a lot of pressure, for being the son of a famous person, who plays in Madrid. He’ll have to get used to it. It will be difficult but it’s part of life. Q: Are you feeling tired now? A: Right now, no. I feel good. I think I won’t be feeling as good at the end of the season than I was at the beginning. But I’m better now than I was one or two months ago. The truth is I feel phenomenal and perfect. Q: Do you watch Barcelona’s games? A: No. If I’m at home and it’s on, I’ll watch it. I’m not like, oh Barcelona is playing at eight and I have to watch. The truth is I don’t watch much football. I’m a sports fan and I watch other sports: basketball, ping pong, basketball (he said “básquetbol, ping pong, baloncesto…”). Q: Do you only watch sports or do you also like movies? A: I watch a bit of everything. I also like to go out. Q: But you don’t go out much. A: Well, you all don’t know about it. I go out as much as needed. Q: When you’re at home, what do you do? Read, watch TV, watch movies? A: All of that, and I study English so I don’t lose it and so I can learn some more. Q: But you speak English perfectly. A: I don’t even speak Portuguese perfectly. (But you speak English, Portuguese, Spanish…) I speak it, I speak it, you understand? But not perfectly. A: It’s because I’m communicating well. I’m a person who likes to learn. When I reached a certain age, around 23, I became more interested in learning more. And now more so, so that I can educate my son well. Q: Do you see yourself doing homework with him? A: Yes, why not? I see myself doing this and enjoying it. Q: Have you changed his diapers? A: Of course. But I don’t like doing it very much. Q: You like to read? A: Not a lot. I do read, but not a lot. Sometimes I start a book, but if I don’t like it, I toss it aside and I start a new one. I’m not a big fan, but I do read a bit. Q: Do you keep up to date with what’s happening around the world, such as the occurrences in Egypt right now? A: When I get home from training, I always watch the news (on Portuguese TV). I always have a bit of curiosity to know what’s going on in the world that we live in. I try to know what’s going on. Q: What worries you the most now? Q: Do many people ask you for money? A: Real friends, no. We receive a lot of letters and people think we’re Santa Claus, but we can’t help everyone. Cristiano Ronaldo then answered some questions from the children sponsored by the El Larguero Foundation. (Another kid) Why don’t Mourinho and Valdano get along? This one is an easy one, you’re mistaken because they do get along very well, they’re friends, they’ve always been friends. Álvaro (9): Would you dare to ask Florentino if he will renew Pepe’s contract? If I were the president, I would re-sign Pepe tomorrow. If I see the president, I’ll tease him about it and I’ll tell him, hey, why haven’t you resigned Pepe? But these are things for the “older” people. Pablo (11): How is your relationship with Casillas? Why were you angry with each other several months ago? It’s all a lie, I’ve always, always, always had a very good relationship with Iker, and with all the players on the team, thanks to God. Víctor (11): What will you do after you retire? Pffff… I don’t know, I’m still thinking about it. I’d like to do many things but it’s still too early to think about that, I still have seven or eight years left. (Work in radio?) No, I don’t like that too much. Raúl (12): If you weren’t a footballer, what would you have been? I would have continued my studies, because I stopped studying early on due to football. (Were you a good student?) I wasn’t a bad student, I worked hard. I wasn’t that kid who wore glasses, you know, but a hardworking kid. I had to study more than those kids with glasses to learn. I had to study at home as well. I would like to continue learning, to take classes. I stopped studying when I was 16 because I was training with the first team of Sporting de Lisboa and I couldn’t do both. I would have liked to study marketing. Or else be a PE teacher. Something like that. (Not a doctor or a lawyer?) That would require a lot of years of studying. (So something shorter). Yes, shorter. Abel (10): Who is your best friend on the team? That’s a good question. I get along with almost everyone. If you ask them, they’ll tell you the same thing. But my closest friends are Pepe, Marcelo and Kaká. But the relationship with everyone is great. With Karim, with Diarra, with Sergio, with Iker… The truth is that we have a fantastic group, because everyone is more or less the same age. We could have formed cliques based on language, but it’s not like that. It’s true that maybe the Spaniards talk more amongst themselves due to the common language, the jokes, the culture… but we all mix together and do things together, but for the more personal things, I talk about them with those teammates that speak my language. I get along with everyone. DLM: What’s Adebayor like? A very good kid, very good. I knew him from England, and I had a good impression of him. He’s a fun guy. (Do you call him Manolín?) Who do I call Manolín? (Adebayor) Manolín? Why? Ha, Manolín, no. Manu. (Sergio Ramos said Manolín) Oh really? It was probably a joke. And how’s Benzema? Is he affected by the arrival of Adebayor? He’s great. A nice kid, a great player. He scored a wonderful goal yesterday. Juan (10): If Florentino asked you for advice, which player would you sign for Real Madrid? You told them what questions to ask! (No, I didn’t. I didn’t speak with you all, did I? Nooooo) I would sign Adebayor, who’s on loan now. DLM: What do you think of Madrid as a city? It’s perfect. A very great city. Very comfortable. I lived in Manchester for many years, so everything outside Manchester for me is… (Would you like to stay and live in Madrid?) Why not? It depends on what happens in my life, if I like it here, what happens with Madrid, but if I had to choose right now, I would love to stay here and live. My family likes it here. But who knows what will happen in the future. And what’s Mourinho like? He’s perfect. He’s a top coach and so he’s used to pressure. He’s going to do good things for Madrid, I’m sure. (You don’t think he’ll leave?) No, he’ll stay here with us. Yoel (17): What did you feel when you lost 5-0 to Barça? Was it the toughest defeat of your life? Would you like to get revenge? Yes, it was one of the most difficult moments to overcome of my career, because losing 5-0 is always difficult but we’ve learned a lot of things from that game, and we won’t make the same mistakes again. Agustín (16): Why do you think you get whistled at and insulted in stadiums around Spain? I don’t know, but I haven’t really thought about it either. DLM: Are you a fan of social networks? You have twitter, no? Yes, and Facebook too. But I have people who… (answer for you). Yes, but they’re people close to me, such as family. I know what they write, but I’m not a big fan of social networks, just a little one. DLM: Do you like to sleep a lot? No, the normal. (What time do you go to sleep?) At 23:30 or 24h. Always. I get up at 08:30h. I have breakfast at Valdebebas. It takes 30-40 minutes to drive there. I have lunch at home, I have someone who cooks for me, and my mom as well. I usually have dinner at home as well, unless we go out to eat with friends or family at a restaurant, but generally I eat at home. Thank you Cristiano, for being here. Thank you. It was a pleasure being here with you, and with these children, who asked me such difficult questions. I was that age once too, where you say what you feel. I hope you all had a good time, thanks for being here with us.